Question: If everyone in the group of ten wants to annul himself, why do they reach a feeling of hate? Answer: If everyone annuls himself, we begin to rise, and then we are added extra ego. Suppose we are together, having achieved a certain connection, and through that, everyone receives the power to annul himself before the friends. In the previous circle, we all were equal, and as a result of our mutual work we rise and create a new circle in which we all become greater and higher than we were before. Each of us seems to remain in the same place, but he raises the whole circle and looks at it from below. All the friends are above, and only I am left below. I don’t see myself in the upper circle, but rather down below. Thus, everyone sees the group as higher than him. We all have annulled ourselves before the others and thus have received a great collective power. We have ascended and corrected ourselves. This means that we have attained our total self-annulment in this new state, but how can we keep on growing? Here, each of us is added an extra ego so that we can grow, like an embryo to whom is added flesh, and then this flesh must take on a certain form. The embryo receives his mother’s blood that clots and turns into flesh by which he grows. This additional ego generates hate in us, and we feel it on every level. If we ascend and annul ourselves, we are ready to ascend to the next level, and then we receive an additional, uncorrected desire to receive from the shattering. We were on the root level of Aviut (coarseness), but in the new state, we already need the Aviut of phase one. 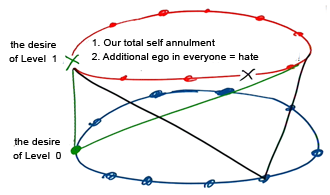 Since we need to receive this gap between the levels, the additional ego is revealed as hate. This is actually what helps us grow. Question: I live in Peru. This is a big country. In just the capital city, Lima, around eight-million people live, but we haven’t succeeded in building a group. Why? Answer: I understand and feel your pain very well, but the idea is that there is a higher program and we cannot understand why it is realized exactly in this manner. As long as we have not reached the root, as long as we don’t see the entire system, the entire soul, where each is located and why he needs to experience this fate or another, until then, we will not understand and will not justify the Creator. We always will have claims against him. I have been disseminating the wisdom of Kabbalah since 1983. At that time I wrote my first three books, just thirty years ago. And I began to study six to seven years before that. In the years that have passed, great work has been done throughout the world. Many groups have invested enormous effort in the creation and distribution of materials through a variety of channels. However, the results are disproportionately small. We see that only few have a desire to attain the truth. Really, there never will be many people like this. That is how the world is built. Such special people are in the minority and it should not be otherwise for all the rest follow them. At the moment, we—a few hundred thousand people throughout the world—prepare ourselves correctly. The world will wake up and follow us. In principle, one shepherd is enough for all to reach the goal. Therefore, it is forbidden to judge according to quantity because spirituality is built fully on quality and one person can be equivalent not only to millions, but billions. Thus, continue to invest effort. Join the American groups through the Internet, and ultimately, we will see as you will come to the conventions with many other people. The main thing here is not to complain. We don’t see the entire “map”; we are not aware of the entire program. It is necessary to accept the result as it is and to act independently of the circumstances. Even when there is emptiness all around, I must turn to the entire world as if everyone is listening to me. Specifically in this way, I direct myself, turning toward everyone as if all seven billion are listening to me, eager to understand and to find out, to absorb every word. This is my duty, and how many among them will the Creator awaken and to what degree is His business. I recommend this approach for everyone involved in dissemination. For then I am “pure”; the Creator establishes the time for the world to awaken, and I accept this with equanimity. Freewill is required to be independent of anything and I must feel it as mine. It is a desire that requires me to be connected with others, but not for achievements and other such results as happens with a commando, sports teams, and so forth. I want to be linked with others to discover the higher force. I require a precise and clear desire to discover mutual bestowal and mutual love of friends so that the Creator will be revealed among us and in this form, we will feel that we are giving Him satisfaction. All this is “depicted” and realized between us specifically if we really have this as a deficiency. This comes not from someone on the outside. No one forces me about anything. I have no personal benefit. It is only for the common good. What we want is that through love of the people, we reach love of the Creator. This desire will bring us to “reception of the Torah.” In other words, we have an opportunity to realize this, not all at once, but gradually, of course. I discover this need more and more clearly. I get the power to develop it. Accordingly, through my link with the group, the Creator is discovered in its center. This is how we advance. Question: How can a desire be independent of anything? Answer: The idea is that I choose the way by myself. It is not just that the reception of Torah is delayed until the “departure from Egypt.” I was always dominated by an ego that is unaware of the spiritual world. This is not about slavery to a landlord; it is not about working from dawn to dusk to provide food for my family. In that, I am not free. Rather, I must be free in my desire to choose the right way. Pharaoh still holds me, is still revealed during the exile in the wilderness, but I already have the power to be directed toward the Creator, toward bestowal, and my desire is free. How can this be? Have I corrected myself already? How is it possible to be free of the ego? However, in spite of all this, my desire to be directed toward the Creator in the right way is truly independent. Question: On what does the strength of this desire depend? There are people in whom it burns, and there are those in whom it barely simmers. Answer: Of course, awakening comes from above, and the question is, will the person realize this with the right choice? The right choice is really the right environment, a group of friends. As long as I have not entered a group, the Creator chooses for me, like we choose for an infant what he needs to eat and what he will do. However, as a child matures, we leave a little room for him, allow him to choose games, offer him the choice of an omelet or porridge. We understand that individuality is awakened in him according to his degree of maturity. Also, on the spiritual path, according to the degree of maturity, a more conscious choice is formed. They give him this choice very simply: through adding some evil, a bad feeling. As it is written, “I created the evil inclination.” The Creator says, “If you want, I will transform it into good. You only need to ask for it.” So, it follows that, for me, the question is, should I ask Him or shouldn’t I? In general, the higher power controls everything. All the evil forces, all the disturbances, all the external factors, everything is in His hands. All good states, all the forces of Light, also come from Him. I stand in the middle. For me, the main thing is to understand that I am linked with the higher power, and It controls me, embraces, and encloses me on all sides. So how, in all the states with which He confuses me, will I be able to want the connection with Him? The problem is found at the edge of my perception, at the threshold of my consciousness. If I feel a faint pain, I can agree that it comes from the Creator and stimulates me to turn to Him. It is said that the Creator is “jealous.” It seems that He is jealous if I turn my attention to someone else. The moment that I forget about Him, He immediately reminds me about Himself, giving me an opportunity to choose. So, here, there is a need to understand where to find the boundary of separation: What kind of pain or what kind of pleasure must I feel to be separated from the Creator? With this, the human being in me is measured. How much I will put the restriction and the screen on myself so that nothing will separate us? Question: We unite in order to correct. How exactly do we achieve the goal of our unity? How do we arrive to a correct connection? 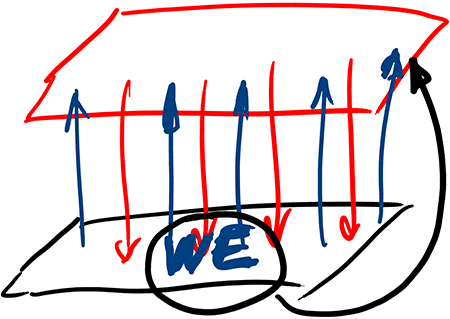 Answer: We have to build the group in a way that is completely compatible with the upper system. The upper system is all about mutual bestowal and kind relationships. Everybody is equal; each one is lower than others so that one can receive from others what they want to give him; each one is higher, bigger, and stronger than others for the sake of giving to them what one thinks is beneficial for them. Everybody is equal within the entire system; everybody is “blended” into one; each one empathizes with others’ desires and strives to fulfill them. This is how we form a general circle in accordance with the technological laws and analog systems with which we are familiar. For example, our body is an analog system in which various processes take place. The goal of these processes is to maintain all parts and subsystems in balance. This is what is called “health”: blood pressure, sugar level, and all other parameters are well-adjusted. This kind of balance of bodily systems is the major law of nature. 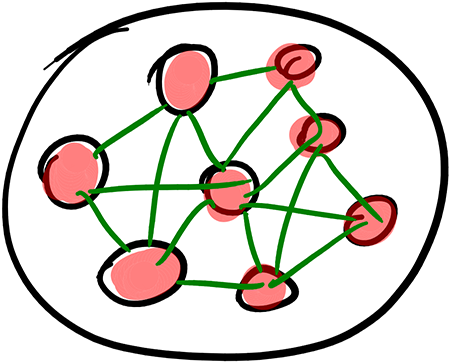 So, if we want to see our groups balanced, we should take care of making all our friends equal and have them included into one another in bestowal and receiving. The system has to act in a way that each of our friends loses his “I-ness” and together with others builds something in the middle, a “raspberry sphere” of our unity (WE). Then, instead of sensing just our personal life in a physical body, we start recognizing unity and all phenomena associated with unity through a spiritual man’s (Adam’s) emotions and intellect, because we become similar to Him. 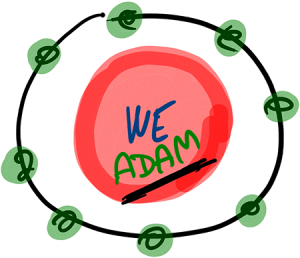 “Adam” is called a “Man,” not each of us individually. If we happen to acquire a sensation of the integral analog network, we find ourselves at the speaking level, yet we still remain present at the animate level. All our desires and aspirations are directed to provide for our physical body, the same as animals that look for shelter and food and create families in order to reproduce their species. Of course our demands are a little bit higher than theirs and we are trying to satisfy them as well. However, only when we take care of “Adam” will we attain the human level of development. Accordingly, we have to build our relationships in the group. There is a list of mandatory conditions that reflect the laws of the spiritual system that influence us. The roots that govern us descend from the upper world into this world. If we want to be in good shape, all we need is to rise from our level to the spiritual level. This is where the forces of Nature are oriented nowadays. So we should follow the Kabbalists’ advice and apply efforts to achieve this state. Technical achievements are useless at this point. All is carried out in human society in our relationships. If we change them in a way that humanity lives up to the laws of unity (WE) and becomes compatible with the contemporary world that is becoming integral and completely interconnected, if we understand that Nature (or the Creator) obligates us to establish connection, we’ll find out why we as of yet cannot receive any answers to the calls of integrality. Only then will we rise to a new level of existence and will feel good. So, we have to follow the patterns that are accepted in the groups since they are defined by spiritual laws. The group is meant to become a spiritual system. Each group’s task is to implement principles of integrality… When we begin connecting into one system, the world starts feeling it. It sets up an example of a correct interconnection among people. Then, the world will come to a better place. This process seems to be pretty far away as of now, but you will see that it will come to life very soon. The developmental speed is exponential, so the world will come to this point quicky because there is no other choice. Question: Why is it that when we talk about the integral network, about integral cooperation, it fades somehow, evades our human consciousness? Answer: The concept of “integral network” isn’t grasped by a person because it’s opposed to his ego. It’s very difficult for him to invest personal efforts in integral work. How can he exit his ego and begin to think about others? Actually, it’s impossible. It’s only when problems come to him that are above his egoism: fears, worries, and threats, and then he thinks about the benefits of society. For example, this is what happens at the time of war since the benefit and good of the society and of man become one thing. And even more than that; the benefit of the society is the determining factor, and it’s as if a person is a secondary part included in society itself. How is it possible that a person will be included within the society as one complete whole without any threats or shocks? For this, public pressure is needed, opinion, a social orientation. But if we leave a person alone without any social pressure, then he won’t be able to do it, since this is his nature. And that is the level of a real united integral society. This is the same level that is found above the present society.